David Sedaris is a regular contributor to The New Yorker and Public Radio International’s This American Life. He is the author of the books When You Are Engulfed in Flames, Dress Your Family in Corduroy and Denim, Me Talk Pretty One Day, Naked, and Barrel Fever. I adore David Sedaris and this collection of stories only confirms why his writing always hits the mark for me. This anthology of short fables will appeal to those with a twisted sense of humor. Not everyone is going to like this one, but I fell in love with the different animals. 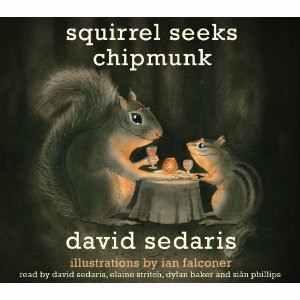 Sedaris gives voice to all sorts of creatures and imbibes them with human characteristics. My favorite short was about the bunny and his gate guarding. I listened to the audio version of this so, I don’t have the titles easily at hand. There is a wonderful moral there (spolier alert!) when his life is finally taken by wolves after brutally murdering anyone who passes his way for not agreeing with him. Thanks for doing this giveaway. I’ve just entered and believe that I’ve done everything correctly! I’ve followed your site for a long time and really enjoy it, although I haven’t commented much. When you have a moment, please check out Bocci’s Beefs-we promote pet adoption and pet rescue and select pet products and services. We’re doing some fun give-a-ways from now through the holidays! David Sedaris is the awesomest! Love him! Thanks for the giveaway. I’d love to read this book. Thanks for the giveaway! Sedaris is a fantastic storyteller. I gots my fingers crossed on this one. This sounds really cool. Thanks for the giveaway! Sedaris always makes me laugh–hope I get to read this one soon! Daily entry 11/29. Thanks for the chance! I follow Forever Young on GFC. I like Swamped on Facebook. I like David Sedaris on Facebook. I Want to run away with David Sedaris…thanks for the give-away Mary. Thanks for the great giveaway! I’ve heard a lot of good things about this audiobook but just haven’t had the pleasure of listening to it yet.